Attorney General William Barr, who has been widely criticized for his brief summary of the 300-page report, has announced that he will release the report to the public by mid-April. He further announced that he will release the report to Congress without submitting it first to the White House for approval. It appears that Barr has backtracked from his intention to submit the report to the White House first––a decision that was widely questioned by experts. Patrick Cotter, former federal prosecutor at the Justice Department and colleague of Barr from the 1990s, has said, “I’m not sure why Barr felt this [submitting to the White House] was the appropriate way to go about handling potentially privileged information.” Cotter went on to explain that Barr had better options he could have pursued, such as setting up an independent committee to review the report for sensitive information. Barr may also be responding to criticism for his failure to submit the report to the public. 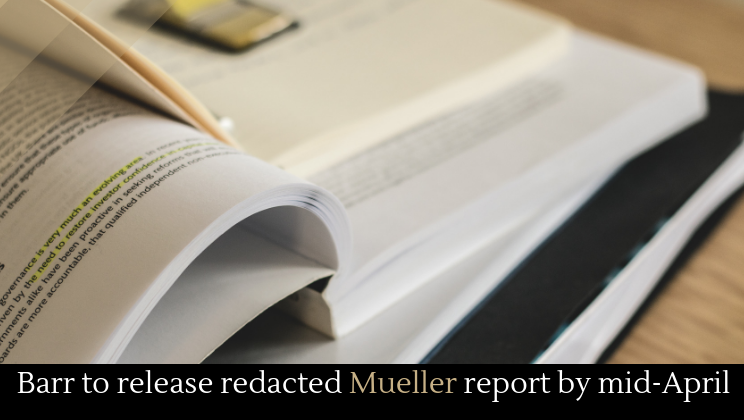 Many are furious that no one has seen the report yet––only the Barr letter. Six Democratic committee chairs in the House have demanded that the Mueller report be released by April 2, though Mitch McConnell blocked the release of the report.